Wind turbines that are taller than Big Ben could be built on the Lizard peninsula in Cornwall. 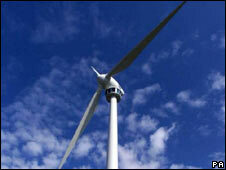 Planning officials at Kerrier District Council have recommended the building of six new 350ft-high (107m) turbines. They would replace 14 smaller turbines at Goonhilly wind farm, and would produce twice the quantity of power. The plans have been criticised by the Cornwall Area of Outstanding Beauty Partnership which said there would be a harmful impact on the landscape. But Kerrier planning officers said the damage would be outweighed by the increase in renewable energy. They estimate the wind farm could generate green electricity for 25 years before being decommissioned.